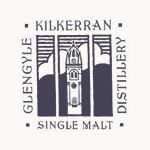 Killkerran whiskies are from the Glengyle Distillery. The Glengyle name was already owned by Loch Lomond Distillers, so the name Kilkerran derives from the Scottish Gaelic â€˜Ceann Loch Cille Chiarainâ€™, a name for the settlement now known as Campbeltown. The distillery was aquired by Hedley Wright, a previous owner of Springbank, who founded Glengyle. Distillation equipment, including the stills, were brought in from the recently closed Ben Wyvis, and the malt mill from Craigellachie.